Three volumes of Your Lie in April has given us 12 chapters worth of content which has moved the story along a considerable amount, a lot more than I was actually expecting when I first started reading the series. As of the end of book three we’re just about to hit a major music competition which is equivalent to episode seven or eight of the anime and it means the next volume of the series is probably going to be the biggest test of my overall concerns going forward. You see, right now I love the characters in Your Lie in April. I may have seen the story through beginning to end once already, but being reunited with Kosei and Kaori has left me feeling really happy. The original source handles the characters as well as I hoped it did, and the comedy moments between them work so seamlessly that it’s like I never left the two. Yes, three volumes in and I feel at home with the characters and the overall setting once again. But I’m worried that as we head into the more musical driven parts of the series that the manga simply won’t be able to convey the same feelings that the anime adaption did. As of volume three we’ve only had one major point of the story that required music and that was surprisingly well delivered even though we obviously lack any form of audio from a manga, but that isn’t to future scenes will work as well (although I seriously hope they do!). Moving away from my musical concerns though it has to be said that this volume of Your Lie in April gets everything right. Character interactions are handled really well and it feels like we get to spend a decent amount of time with all of the main cast, even though this point of the story is heavily focused on Kosei. Music takes a backseat as we learn a little more about Kosei and Tsubaki when they were kids, as well as how distant Tsubaki now feels from Kosei because of Kaori being in the picture. 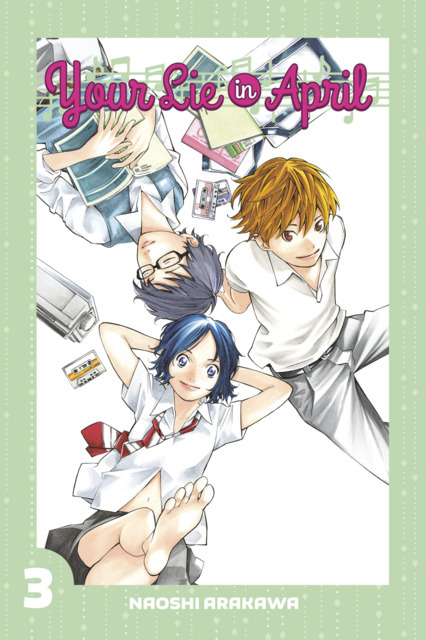 Watari and Tsubaki both face important games for their chosen hobbies this volume and thus both have to face their feelings of jealousy toward Kosei and his musical abilities after the fact, and while it’s something that is only touched on rather than being the focus of the story, it’s done in such a way that it ultimately becomes very important to the development of Tsubaki and Watari. Perhaps the manga hasn’t been as focused on Kosei as the anime was at this point, or perhaps the manga has just managed to develop Tsubaki and Watari better than the anime had at this point, but either way I care a lot more for these characters now than I did at this point the first time around. For a series that is fairly simple at its core Your Lie in April continues to amaze in the little things it does. These characters, their feelings and hardships feel realistic and easy to understand. Kosei is grounded and even after everything he’s gone through, his determination in picking up music again is something to be admired and cheered on. Again though, a lot of the series’ best moments are in little conversations; they are in Kosei and Kaori discussing how you, the musician, wants to play a piece of music and how Kosei doesn’t really know how he wants to play music. They are in how Kosei has the hands of someone who plays piano and someone who is itching to be doing so when he isn’t, and they shine through in little references and nods to Kosei’s passion for what he’s doing. By the end of volume three of Your Lie in April it feels like we’ve already come a long way with these characters, but there is also the feeling of more important events to come and how I truly cannot wait to experience the rest of this journey yet again. Your Lie in April is something special, it inspires and tells a story that you just need to see, even if you aren’t interested in music. Your Lie in April is currently being published in English by Kodansha Comics and three volumes have currently been released, with a fourth due for release in October.